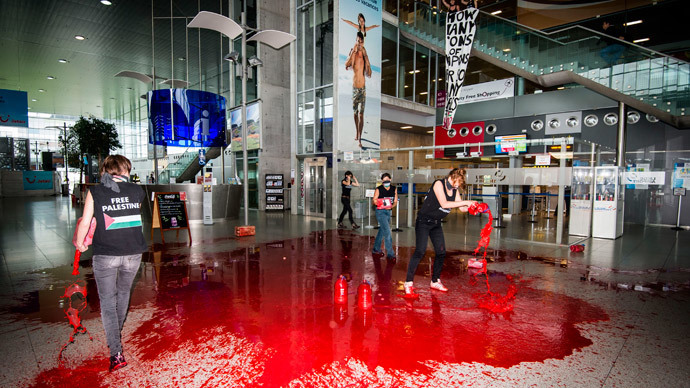 A Belgian feminist activist group LilithS literally painted Liege Airport red with a hundred liters of fake blood at the facility’s role in arming Israel. The red pool of ‘blood’ symbolized their perceived ‘slaughter’ of Palestinians in Gaza by Israel. Six women took part in the protest at 11.30 am on Tuesday. 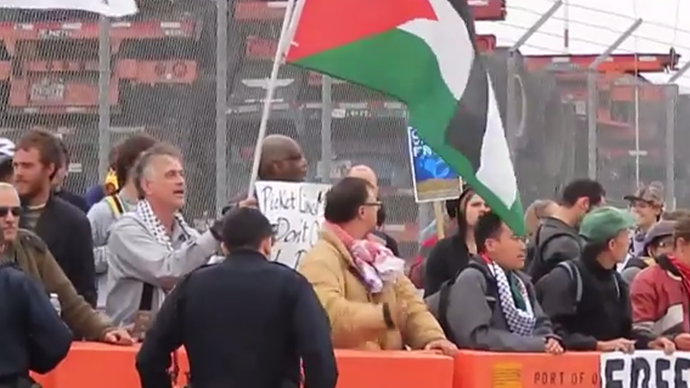 The members were all wearing t-shirts bearing the colors of the Palestinian flag as well as the slogans “Terrorism is real” and “Free Palestine.” They also unveiled a banner with the slogan: “How many tons of weapons for so many liters of blood?” the groups Facebook page stated. Their man gripe was how they believe Liege Airport is being used to transport arms for Israel, which are used against the people of Palestine. LilithS says that the Belgian government and the European Union are turning a blind eye to this, as long as the military material being transported does not change vehicles. 26 Belgian non-profit organizations and other political parties have also spoken out against the lack of transparency shown by the airport. Amsterdam’s Schipol airport in the Netherlands was used to transport Israeli arms from the United States. LilithS’s Facebook page states that from 2005 to 2006, more than 160 million explosives, 17 million weapons and one million cartridges, tear gas canisters and detonators were sent to Israel, via the Dutch capital. These weapons were used in Israel’s campaign against Lebanon in 2006 and led to the loss of over a thousand people, the group added. The US started to transport weapons to Israel via Liege after Amsterdam introduced tougher regulations to its Schipol air hub. LilithS says the Belgian airport has no such transparency policy. However, Chirstian Delcourt, a spokesman for the airport says “there are no weapons that pass through this airport. This is an unfounded rumor, which you hear every time there is an escalation in the Israeli-Palestinian conflict,” the Belgian website dhnet.com reports. He also stated that Liege Airport intends to file charges against the feminist activist group. A long-term truce in Gaza was agreed with Israel, Palestinian President Mahmoud Abbas said on Tuesday, as the conflict entered its 51st day. 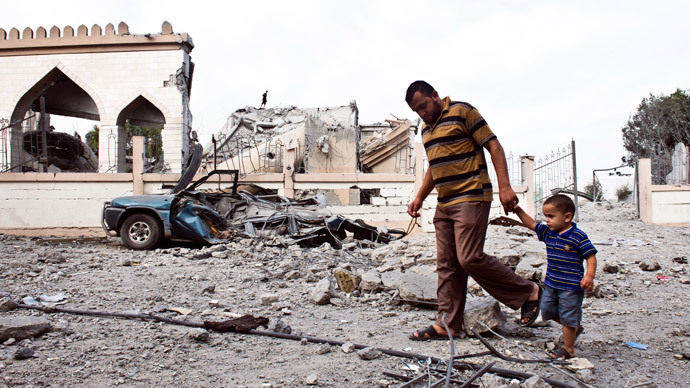 The ceasefire came into effect at 16.00 GMT and was announced by Egypt. Since the conflict started on July 8, the death toll reached 2,210, the vast majority of whom were civilians and 577 were children, according to the Palestinian Health Ministry.